Under The Copper Tree: Thanks Santa! I really don't want to push the whole resolution thing, because of the inevitable breaking of my proposed resolutions. Goals sounds safer. So one of my goals is to write more. But not write for writing's sake. So many things quickly become forgotten and I really don't want to let anything pass me by this year. I also want to try and save more, spend less. Unclutter. Be nicer. Things. I'll let you know how those things go. Today the family got together to celebrate Christmas and New Years. After the death of my grandfather, I would have thought we would get together more often - especially during the holidays. We did at Thanksgiving, but life got in the way for Christmas. And New Years Eve... everyone did their thing separately. I was upstate sick and baking. I still am feeling sick and tried my best not to pass it on. When I say family, it also includes the extended family. And there are a lot of us, making gifts difficult. So we have resorted to Secret Santa/Kris Kringle. The names of all those participating are thrown into a hat and the name you draw is the person you get a gift for. At first it was just the adults, and us kids still received presents. But we're now adults so we're having a Secret Santa of our own, with a few differences. The parents set their limit to $50; we settled on the $20-$50 range. We have a group on Facebook where we list some ideas of things we would like (call it selfish/materialistic/not in the spirit of the holiday all you want, but I appreciate the suggestions... and knowing sizes! ); the parents take a wild guess. I got my cousin J some makeup thing from MAC, M got my cousin R an Otter Box. R's girl K got me what you see above. They didn't have to get me both, and I was not expecting it at all. But it was a bit of a thank you for my baking cakes and little treats for their son. His birthday was on Thanksgiving and I made him a chocolate cake with chocolate fudge buttercream. On an uncle's birthday I made a banana cake with cream cheese frosting and he absolutely loved it. He has an allergy to peanuts and a handful of nuts so I have been trying to be very careful in my baking and take it into consideration when choosing recipes. Have you ever seen the documentary "Kings of Pastry?" It follows pastry chefs compete in the Meilleur Ouvrier de France competition for a chance to be awarded the title of MOF. Those French and their titles... Anyways, one of the pastry chefs in the documentary is Jacquy Pfeiffer. 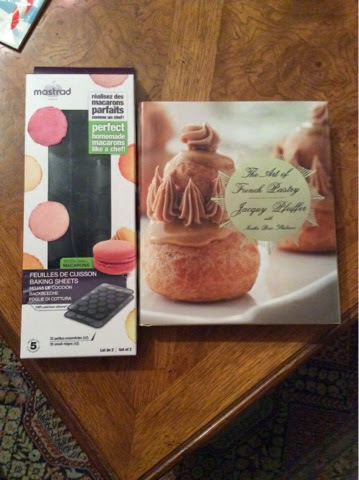 He also wrote the book, "The Art of French Pastry" which I got as my Secret Santa gift. I flipped through it quickly and ohmygoodness I will have a lot of fun trying these recipes out. The page I opened up to was a recipe for Anise Macarons. It lists metric measurements which since my baking class, is the only way I do my baking. Helping me perfect those macarons will be the silicone baking mats I also got. But it also has other uses... not just for macarons. Incan make uniform meringues and meringue clouds. And Nila Wafers. Not that I'm craving them, but I can make them and make them uniform. Now I just need to find a good nut-free recipe. Chef Jacquy was a mentor of mine and this book is pretty great! How far along are you at SCCC? I'm not in the degree program, just taking classes. I just finished up American Baking and Pastry. I was hoping to get into International or Commecial, but those classes filled up quickly. So I may have to wait until the fall for another class.